Mont-ras is our local neighbourhood so we do a lot of walking from here. One of the things we really enjoy is the variety of walking - one day we can be walking through the fields and farm land, the next up in to the Gaverres in what feels like total isolation. The area behind Mont-ras up into the hills is effectively a protected park - (a space of special natural interest). It broadly consists of wooded valleys that wrap around the hills. As you go higher you get a view out to the sea and across the Empordan villages below. 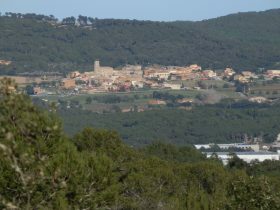 The woods themselves are used for mountain biking and hiking, and there are isolated Casitas among the trees, and on the top towards Fitor there are a handful of very large scattered old masia farms and open fields. The way the valleys fold means it's relatively easy to find yourself in almost total isolation in the middle of nature. The walks and paths themselves aren't particularly well marked on maps. The maps tend to show the larger routes suitable for 4x4s or mountain bikes, but there are many other smaller tracks for walking that link across these paths - and are relatively well used by walkers, forestry or people out hunting. Although it is possible to feel lost on the small tracks, in practice it is difficult to get completely lost. At some point you hit a larger route and can always find your way down to civilisation. The paths themselves vary and one path may go from soft sand one minute to rocks the next. Broadly most paths will be a mixture of sand and rock so it's worth having shoes with proper soles. You won't find the soft peaty-type paths that you typically find in UK woods so it can be harder under foot. The paths can climb and drop but are always walkable (so no scrambling or steeper climbs). 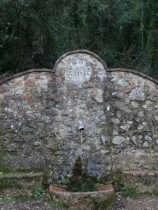 This walk we call the fountain walk because it runs down to Font de la Teula - a fountain spring in the middle of the woods. It doesn't appear on the general maps but is easy to find and to follow with a variety of options for short- or long-cuts. In particular you can use it as one route to Llofriu, the next village around. 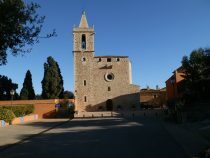 We start at Mont-ras church. There's a car park next-door, or if you prefer there's more parking (and a bar to come back to) down by the roundabout over the C31. The path heads up and bears to the right to a sandy track called Carrer Major (to which someone has added an exclamation mark as it doesn't really look like the main street). Follow the main path - after about 2-300 metres it forks near some beehives - the shorter, steeper route is to the left, and meets the straight on route higher up. Basically you want to always be heading upwards. Towards the top the path becomes flatter and sandy - keep going straight with views over Palafrugell and Regencos to your right and you'll reach the 'Col de la Boqueta'. This is a confluence of several paths one of which is the main double-width sand track for cars driving up to Fitor at the saddle-point as the road passes from one side to the next. Follow the double track as it goes upwards gently. After about 50m to the right a (currently fallen down) signpost marks the direction to the Mont-ras Mirador - a viewpoint over the plain below. Continue along the road a little further. You should see another signpost on the lefthand side of the road with a wonky pointer. On the opposite side of the road (to the right) is a track running into the woods. This track to the right is the one to follow. Although flat initially it quickly starts to run down a valley - where you come to junctions keep bearing left. The path runs through a couple of high sided gulleys where water has lowered the path level relative to the ground and the gulley walls are now more than a metre high. The path runs down through the woods until it reaches the Fountain (Font de la Teula) at the bottom. From here there are two options. 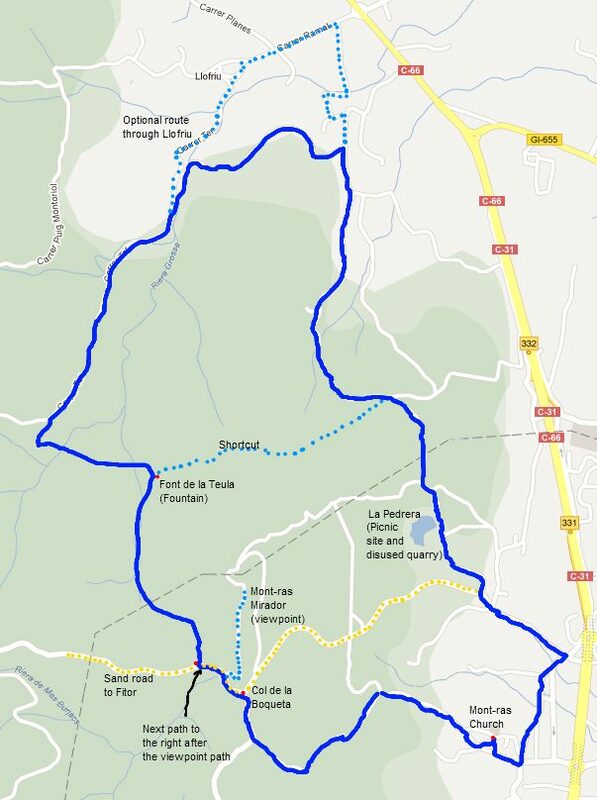 The route to the right broadly brings you back to Mont-ras via La Pedrera - a former quarry now picnic site. The route to the left goes deeper into the woods. You can follow this path for a long way if you wish and it would eventually curve around to run back towards the Col de Tramuntana and Mas Torroella one of the farm houses at the top of the hill that is reached by the double-track road. This would be a long route, so the first time you see a left turn (almost seeming to go back), follow it and this will eventually take you out towards Llofriu. 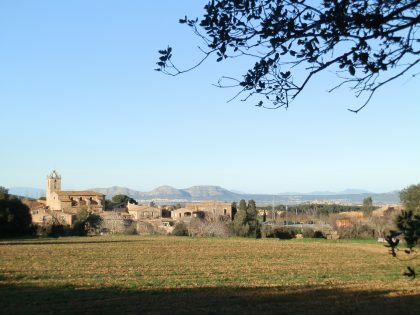 As the track leaves the woods, it splits in two - the left side runs past a large imposing Masia (Roma) and then on into Llofriu itself. The right side is on the other side of the stream and will take you around the back of the village. Llofriu itself is very pretty being a bundle of old houses around the church and stream. It's off the main road and the only way in or out by car is the one road. 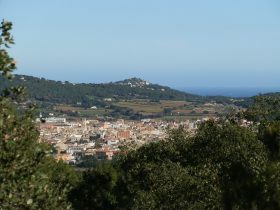 Along from the old village are a collection of houses actually on the main Bisbal-Palafrugell road with three restaurants that always seem popular. Assuming you take the right-hand track like the map, follow this until it meets another main looking road. At this point you turn right, again almost back on yourself, towards the farms. Follow this path past the farms (the fields often have donkeys). When you see the rusty windmill/pump where the path splits, take the left path back into the woods. You can then follow the path along and past the Pedrera picnic site and back into Mont-ras.